SourceGear, known for their Vault source control software, are giving away their three-way diff & merge tool DiffMerge for Windows, Mac and Unix. DiffMerge has a clear interface and supports for file-type specific rule-sets that allow you to decide how to deal with white-space, line-endings, encoding etc. I’ll be using it instead of my trusty KDiff for a couple of weeks to see how things go. To use DiffMerge in AnkhSVN head into the Tools > AnkhSVN > Edit the AnkhSVN Configuration menu option and then paste each of the following command-lines into the associated configuration option. C:\\Program Files\\SourceGear\\DiffMerge\\DiffMerge.exe "%base" "%mine" /t1="Base version" /t2="My version"
C:\\Program Files\\SourceGear\\DiffMerge\\DiffMerge.exe "%base" "%theirs" "%mine" /r="%merged" /t1="Base version" /t2="Their version" /t3="My version"
Alternatively you might want to check out Trevor Green’s instructions on using DiffMerge with TortoiseSVN if you are not yet sold on AnkhSVN and it’s Visual Studio integration. A newer registry file is available to provide AnkhSVN with Visual Studio 2008 and Vista support in one. If you are using Visual Studio 2007/2008/Orcas/9.0 you will have found that AnkhSVN 1.01 doesn’t appear in the IDE. Like many Visual Studio add-ins AnkhSVN should work just fine but won’t appear because the installer does not write an entry for it in the 9.0 section of the registry. 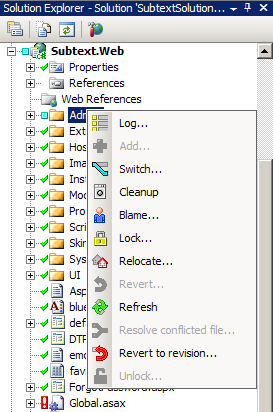 All we need to do is export that section out, change the 8.0 to 9.0 and then run it back into the registry. This technique should work for any other add-in’s you have that are only appearing in 2005. If you installed AnkhSVN into the default folder try these registry files I have prepared for 32-bit or 64-bit machines.